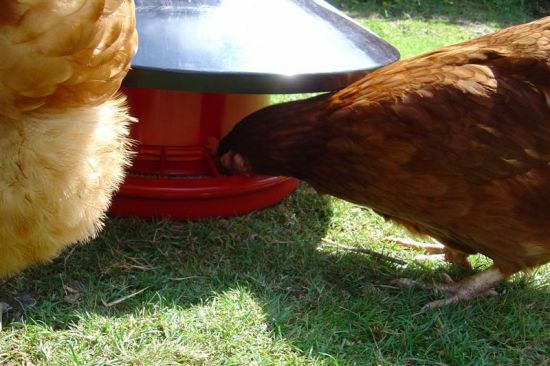 Allen & Page’s “The Organic Feed Company” make the Layers Pellets which our hens eat as their main food. The feed is recognised by the Soil Association as organic. The pellets are a farmyard layers feed which produce a deep natural yellow yolk with fantastic taste because it contains no yolk pigmenters which other feeds use. The pellets are drug-free and are ideal for our hens who enjoy living free range because they are designed for non-intensive conditions. Other types of food is available, they are formulated for high performance diets for intensive or commercial production. This entry was posted in Hens on December 23, 2004 by Daniel. What are fresh eggs like? How many eggs do the hens lay? Our hens produce an egg each most days, so that makes four every day – just over two dozen a week. Occasionally there’ll be just three eggs, but that doesn’t happen very often. This entry was posted in Hens on December 21, 2004 by Daniel.